HSBC in the Community (USA) Foundation Inc. The ESF Ranger School has received a $25,000 grant from the HSBC in the Community (USA) Foundation Inc. and will use the funds to develop the arboretum at The Ranger School campus in the Adirondacks. 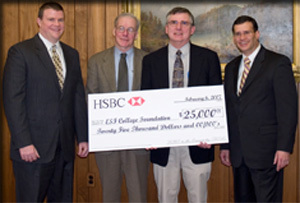 F. Mathew Zlomek, HSBC senior vice president and ESF College Foundation Inc. board member, and Paul Pichoske, HSBC senior vice president and district executive, presented the grant to ESF President Cornelius B. Murphy, Jr., and Ranger School Director Christopher Westbrook on the ESF campus. The arboretum is a collection of living trees and shrubs, used to complement The Ranger School students’ field experience and classroom study. The arboretum was established in 1940 and expanded to about 10 acres in 1995. It includes about 60 species common in the northern hardwood and boreal forests of the Northeast, particularly in the Adirondack region. Some non-local species, such as ponderosa pine, pitch pine, and tulip poplar are also present. In addition to Ranger School students, the arboretum is used by local school groups and by visitors with an interest in learning about trees and shrubs. The HSBC grant is earmarked for trail improvement, procurement of new species, soil improvements, and landscape design. This is the second year in a row The Ranger School has received a grant from HSBC. Last year, the gift was used to develop interschool professional development between the Ranger School and forestry faculty from Bavaria. The Ranger School has educated more than 3,000 graduates. Its programs in forest technology and land surveying technology have a national reputation for excellence. The school, established in 1912, is located in the community of Wanakena in the Adirondack Park. HSBC in the Community (USA) Foundation Inc. is the charitable foundation of HSBC Bank USA, N.A. and was created to carry out the bank's mission with a philanthropic strategy focused primarily on education and the environment.